This page is for any one who is looking for information about most any type of bird. From the little Budgie, to the Macaw looking down from his large perch. If your interest is more for the wild ones, well the roost here too, ostrich and emu on farms up to the Barn Owl in the tree. 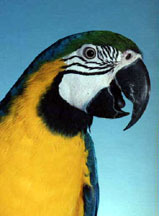 General,General Bird Care & Information, Budgie, Canary, Cockatiel, Finch, Parrots, Farm, Wild, Eagles, Owls, Societies, Groups & Rehabilitation, & Birding Looking for a new pet don't forget to check the shelters!